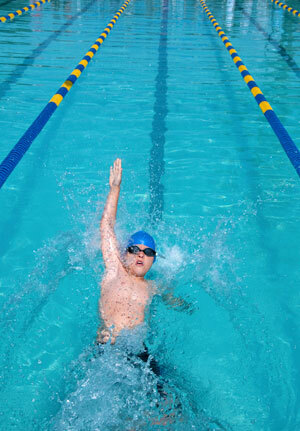 One approach is to swim in one of the side lanes of the pool. Most of the time the pool ladders are close to the end of the pool. When you swim in one of the side lanes, you should be able to spot the ladder in the corner of your eye and know that you are almost at the end of the pool. Another strategy is to know that the backstroke flags are located 15 foot (5 meters) from the end of the pool. So once you pass under them you know you can slow down because you only have a few more arm strokes to take until arriving at the wall. At that moment you can also roll your body to be positioned face down and swim the rest of the length watching forward. A third strategy is to observe the ceiling of the swimming pool and see if there are marker lines or other noticeable features that you can use to recognize the end of the pool. That being said, with experience you get a feel of how far you are from the wall and don’t need to check for specific cues anymore. You can also stop stroking with your arms and keep one arm extended forward when you are near the end of the wall to avoid bumping into it with your head. Finally, in the backstroke, there’s an overlap between the arm strokes such that most of the time one arm is at least a little bit or much more in front of the head. That’s why I have only seldom hit the wall with my head. But when it happens, it hurts, that for sure.